Southern African Peace and Security Blog: Is Zimbabwe Poised for Another GNU? Is Zimbabwe Poised for Another GNU? Although not necessarily a new trend in political practice, Governments of National Unity (GNUs) seem to have gained popularity in the recent past, consequently becoming a preferred method of resolving electoral and political disputes in Africa. African diplomats, regional bodies and in some instances international actors like the African Union (AU) and the United Nations (UN) have been instrumental in establishing or encouraging the formation of GNUs or similar mechanisms in countries like Zimbabwe, Ivory Coast, Kenya, Liberia, South Africa and Zanzibar to mention a few. However; the efficacy of these arrangements have not been a subject of serious academic an policy debate hence very little theoretical and empirical evidence seem to suggest that GNUs can be effective mechanisms for resolving national disputes. Early in February 2019, the President of Zimbabwe, Emmerson Mnangagwa invited political parties that participated in the in July Harmonised Election to a ‘national dialogue’ at his state residence to discuss ‘a Framework for Post-Election Dialogue by Political Parties’. The invitation was snubbed by the Movement for Democratic Change (MDC) leader Nelson Chamisa who argued that the purported dialogue was meant to give a veneer of legitimacy to Mnangagwa and his ZANU-PF party he accuses of ‘illegitimacy’ arising from a ‘stolen election’. Some 19 or so opposition parties responded positively to the President’s invitation. MDC is Zimbabwe’s biggest opposition party since the turn of the millennium and the leadership’s decision not to attend the dialogue is significant for anyone with an interest in Zimbabwean politics. The MDC argued that dialogue is not a monologue and ZANU-PF cannot simply preside over an election it stole. The MDC leadership tabled terms and conditions which ZANU-PF should first meet before any talks can resume. Among them was the release of its members charged with dubious ‘crimes’ during the January fuel protests and the importance of a neutral mediator to oversee and facilitate dialogue. While chances of a GNU seem unlikely in the short to medium term, it is important to examine the efficacy of a GNU in resolving Zimbabwe’s multiple crises. In this regard, I pose two different but complimentary questions. First; can a GNU transform Zimbabwe’s crisis? Second; if we agree that dialogue is important what form and shape should it take? I attempt to unpack these important questions in two parts. First; I provide a context of GNUs and the various circumstances that le[a]d to their formation. This is important because it enables us to critically engage the efficacy of GNUs by asking important questions relating to the crisis in Zimbabwe. Second, I argue that while national dialogue is important, it must not coalesce around the idea of a GNU. I support this position by arguing that a GNU will not be a panacea to the Zimbabwean crisis and those calling for it probably misunderstand the nature of the crisis or simply want a quick fix to a complex problem. In advancing this point, I am in no way denying the magnitude of the crisis in Zimbabwe. In fact the crisis has reached a stage where national dialogue is not only urgent but desirable too. But what are the issues the dialogue must tackle? With the exception of South Africa’s interim government that ushered a new democracy in 1994, most GNUs on the continent have emerged following electoral disputes between leaders of opposing political parties. This was the case in Kenya involving a disputed election between Mwai Kibaki’s Party of National Unity (PNU) and Raila Odinga’s Orange Democratic Movement (ODM) in 2007 and in 2008; Robert Mugabe’s ZANU-PF and the two MDC formations led by the late Morgan Tsvangirai and Arthur Mutambara. From a pragmatic perspective, GNUs are temporary ‘compromise governments’ formed between opposing parties following a dispute usually an electoral dispute. From a conflict transformation angle; GNUs are power-sharing mechanisms created to end hostilities between disputants and also to pave way for unity and stability in the hope of achieving positive peace. However, the reality is that they achieve none of this. In this regard, the experience of both Zimbabwe and Kenya is poignant. However, this is not to suggest that GNUs are of no consequence. There are positives that the GNU in Zimbabwe brought and to dismiss these gains would be dishonest. For example, it stopped the mass killing of opposition supporters although incidents of sporadic political violence, land grabbing and intimidation of opposition supporters continued even during the GNU. It also stabilised the economy and arrested a run-away inflation. However, political tensions carried over from the pre-2008 period continued to threaten and have a negative impact on the economy. Accusations of deliberate sabotage were constantly raised by political leaders. Counter accusations somewhat gave the impression that political leaders are not signing from the same hymn while policy inconsistencies kept potential investors on their feet. This among other factors threatened full economic recovery. The GNU was also criticized for failing to resolve power imbalances. For example, there are claims that power was not evenly distributed; with ZANU-PF retaining all important security portfolios and the MDC getting less important and influential ministries. This arrangement frustrated security sector reforms that were key to GNU. The most cited criticism of the GNU is that it retained an election loser as state president. This gave Mugabe the leeway to make unilateral decisions, sometimes without consulting his principal in complete violation of the Global Political Agreement (GPA). Having highlighted contentious issues involving GNUs, I now turn to one of the questions posed earlier; can a GNU transform Zimbabwe’s crisis? The answer is not so much! To create a context for my argument, I draw on few but key lessons from history. While Zimbabwe’s crisis is multifaceted, there is no denying that the crisis is first and foremost political. The nature of the crisis in Zimbabwe makes political reform a priority and as such any arrangement that fails to address this important aspect is tantamount to rearranging decks in a sinking ship. In both Kenya and Zimbabwe, GNU negotiations failed to adequately address the power and leadership questions (political question). In a classic case of ‘change without change’, the negotiations in both Zimbabwe and Kenya retained election losers as presidents. There is no reason to believe another GNU in Zimbabwe would have altered this trend. Related to that is the criticism that GNUs have a tendency to reconcile political elites while leaving the masses divided. The point here is that Zimbabwe does not need a GNU but a complete overhaul and restructuring of a system that breeds violence, intolerance, corruption and mismanagement. Chances that a GNU can undo these vices are close to none. There is also no evidence that the GNU in Zimbabwe (2009-2013) tackled common people’s problems like corruption and governance malpractice. Instead the GNU morphed into a power contestation where focus was on sharing political spoils and not the political and social transformation of a state structure that had bred the crisis in the first place. By way of conclusion, I share some reasons why a GNU today would be a hard sell even to the most sympathetic and moderate interlocutors. First, the circumstances that led to the GNU in 2008 are at variance with the situation obtaining in the country today. First, the June 2008 election in which Mugabe controversially declared himself winner contravened regional and international best practice on elections and governance. Tsvangirai’s pull out solidified this claim. However, in the July election pitting Mnangagwa against Chamisa, not only did the latter participate but various international and regional election observer teams applauded both parties for holding what they deemed to have been a ‘peaceful election campaign in decades’. This was of course in comparison to past election campaigns enveloped in fear and uncertainty. In addition, Mnangagwa accredited election observer teams from over 40 countries including some previously banned by Mugabe. The motivations behind are a discussion for another day. 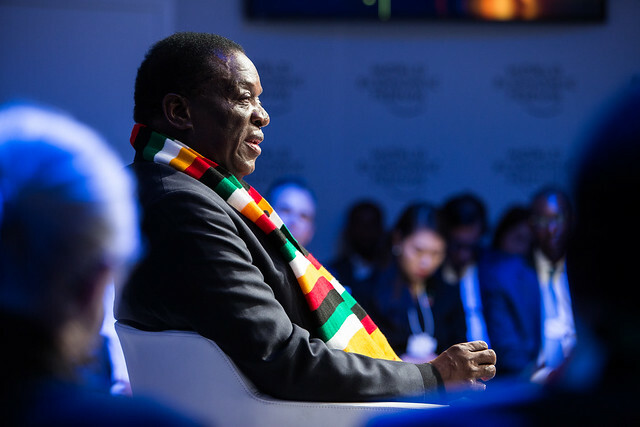 Most importantly, the international goodwill that carried Mnangagwa through the elections saw him receive less condemnation for the post-election violence that claimed six lives and injured dozens. Last, the political climate leading to the election in July was relatively stable. Opposition parties were for the first time ‘allowed’ to campaign in known ZANU-PF strongholds. In the June 2008 runoff, not only where MDC leaders persecuted but their followers and supporters killed, raped and abducted in broad daylight. The human rights abuses attracted international condemnation forcing Mugabe to negotiate with the opposition to save both his reputation and that of his party. In contrast; SADC and AU’s deafening silence over human rights abuses in January as well as the post-election violence (PVE) in August may have convinced Mnangagwa and ZANU-PF that it is possible to get away with murder and human rights abuses. Darlington Tshuma is a PhD Candidate in the Peacebuilding Programme at Durban University of Technology, South Africa. He is a graduate of the Durban Transformational Leadership Programme and a Canon Collins scholar. He writes in his own capacity.